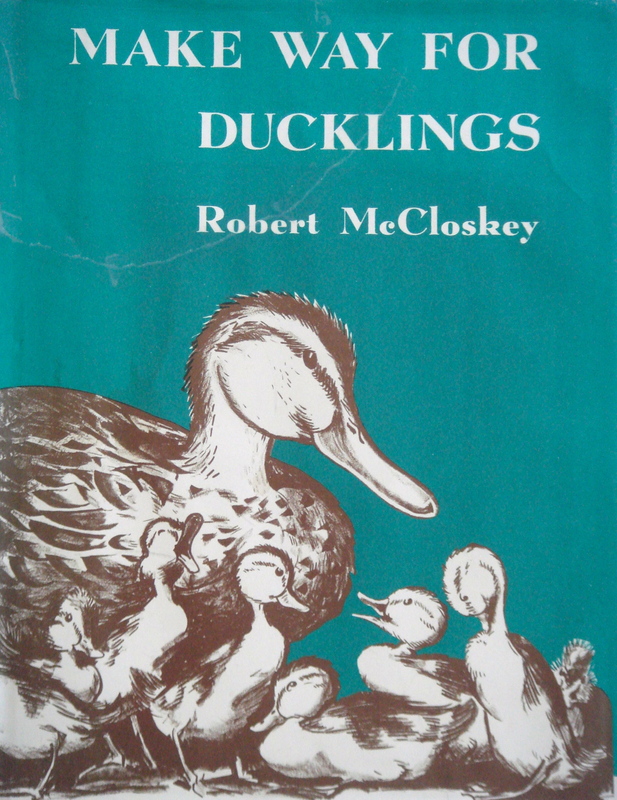 Shortly before Robert McCloskey’s death in 2003, Make Way For Ducklings was made the official children’s book of Massachusetts, prompted by students in a third grade class. Hard to imagine a more appropriate award, for McCloskey was a master at evoking the essence of place. 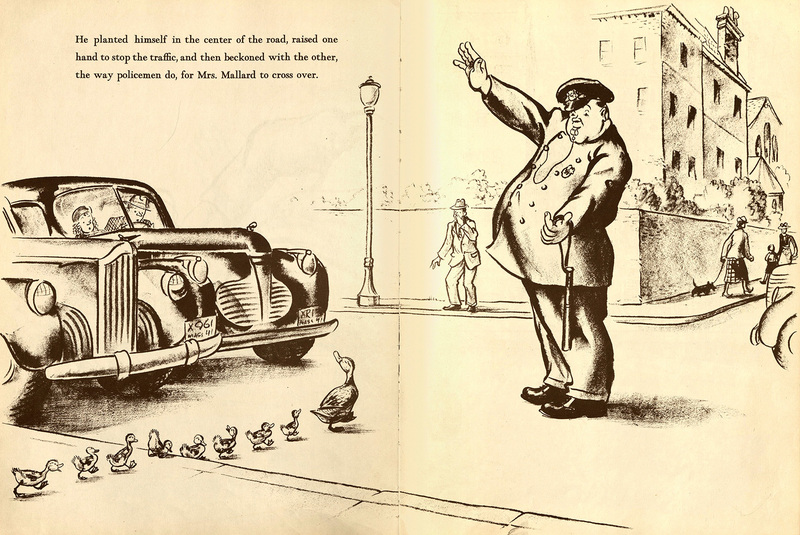 What Make Way For Ducklings was for Boston, Time of Wonder was for coastal Maine and Homer Price was for Centerburg, Ohio. The eight books that he wrote and illustrated were each a celebration of one of these three settings, each of which he knew well. His books were also a quiet celebration of America – apple pie, blueberry picking, donut machines, harmonicas, a certain unpretentious can-do spirit, common-sense competence, and innocent understated humor. Make Way For Ducklings stars Mr. and Mrs. Mallard, a pair of ducks who settle on an island in the Charles River, free of foxes, turtles, and boys on bicycles. After their eight ducklings hatch out, Mr. Mallard goes off exploring while Mrs. Mallard teaches her offspring to swim, dive, and follow in a straight line. 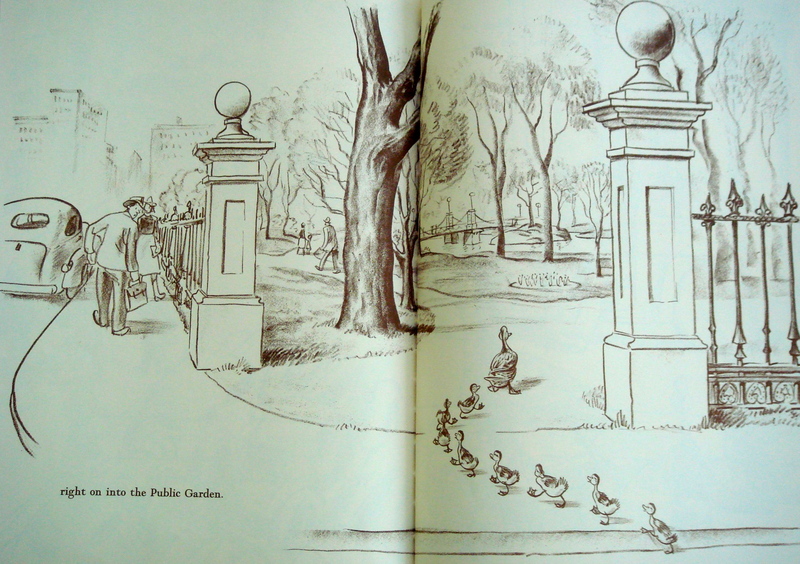 When it is time for their rendez-vous, Mrs. Mallard proudly leads her brood in a single file procession through the streets of Beacon Hill and through the gates of the Boston Public Garden. They are helped along the way by Michael the policeman and Clancy from headquarters who stop traffic to allow their safe passage. There is something fascinating about the ordered geometry of birds, be it the V-shaped pattern of migrating geese, the wind-facing seagulls on an island rookery, or the following behavior of imprinted chicks. It is the image of the proud Mrs. Mallard and her trail of spirited ducklings – delighting the boy in the Corner Book Shop, amazing the street sweeper on Charles Street, bringing traffic to a halt on Beacon Street – that is the lasting one. Make Way For Ducklings is one of the most enduring and beloved of picture books – both the story and the illustrations are imbued with honesty and quiet humor. 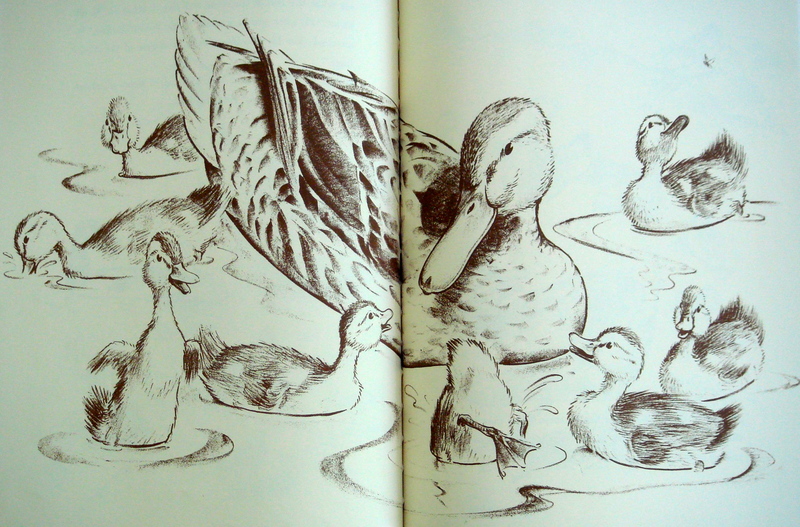 To perfect his drawing technique, McCloskey brought a dozen or more ducklings home to his West Village apartment and lived with them long enough to make hundreds of sketches. In the book, every twitch of the tail, every preening of the breast feathers, every flap and waddle seem true. The humans, in contrast, are comical caricatures. 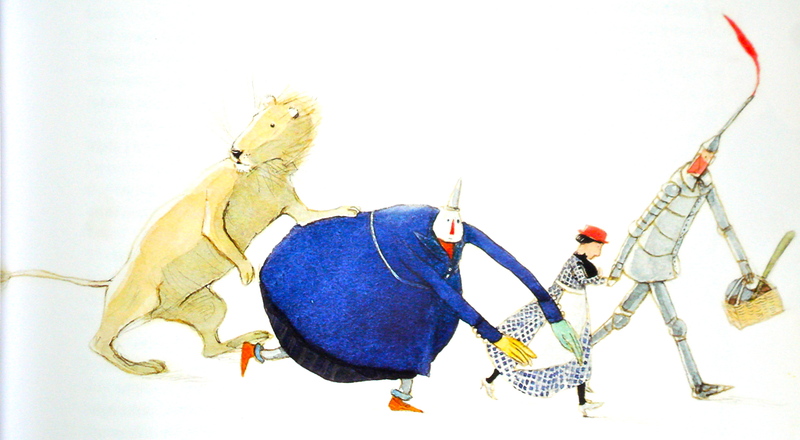 As an artist, McCloskey was talented and meticulous – he was the first to receive two Caldecott Medals (for Make Way For Ducklings and Time of Wonder) and he was also awarded three Caldecott Honors, a remarkable achievement.